You’d think that, with my annual bike trip in June fast approaching, I would be riding often in preparation. Actually, I have not ridden once yet this year. It was a long winter! Now that it has warmed up, it would make sense for me to get out and log some miles, but what did I choose to do instead? I started dismantling my bike to give it a much deserved cleaning. Do you think there could be some subconscious factors at play that have me sabotaging my preparations for this year’s trip? 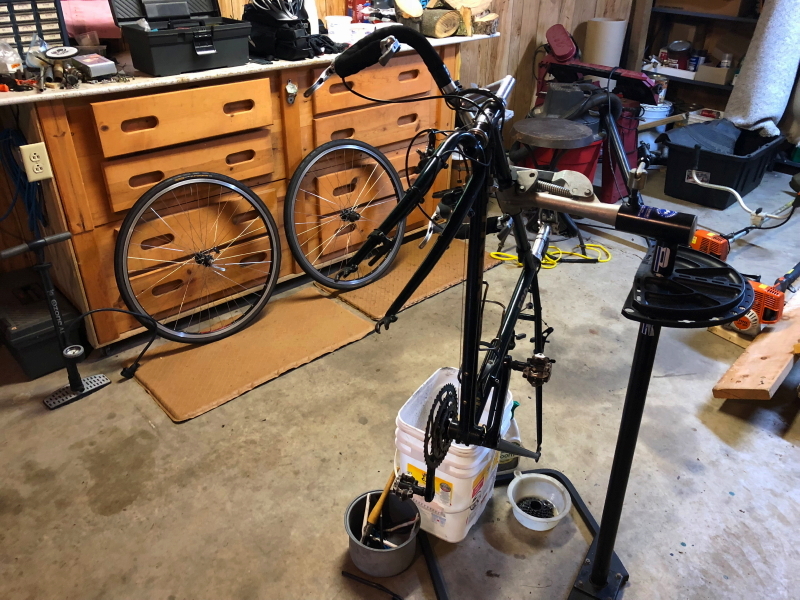 Why didn’t I do the bike maintenance when it was snowy and cold? In case you didn’t notice, my post for yesterday didn’t publish in the morning as I had intended. I don’t know what step I may have missed, but I have no reason to believe it was anything other than an unconscious oversight on my part. By late afternoon, when my sister, Judy, checked in with me to learn why I hadn’t posted, it only took one swipe to publish from my phone. I had been that close. Just missed the last step. I was probably distracted by thoughts of how I could be dismantling my bike down to the raw bearings to clean and grease everything so that I could then start riding it in preparation for the trip. I wonder if my diligent planking exercises twice a day to support my ailing lumbar discs will translate to biking fitness. What I should really do is rig up my office chair to mount my bike seat on it so I can start building up calluses on my caboose while working at my desk. It seems like the only progress I am making is in complicating my preparations for the Tour of Minnesota bike trip this year. That’s a lot more like Not progress in my book.